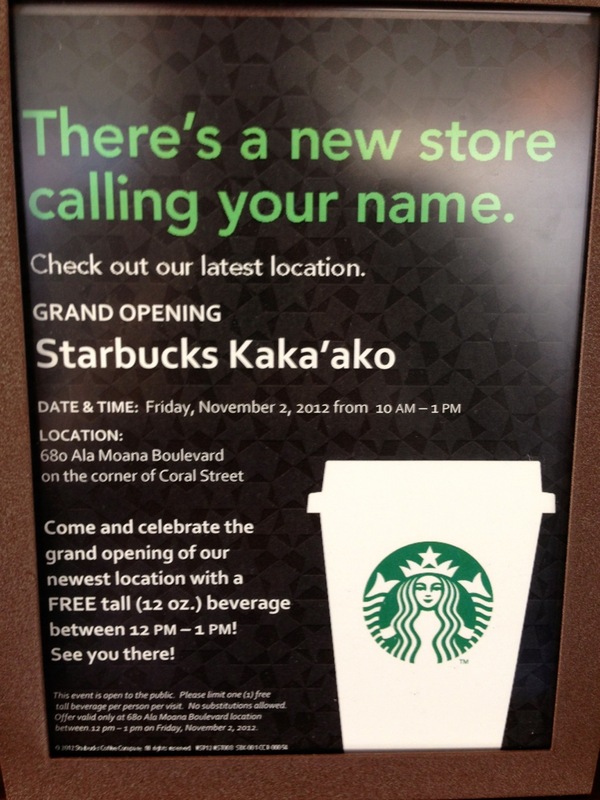 Starbucks Kaka’ako has been open for business for a few weeks now but is celebrating its official grand opening today, in fact right now! 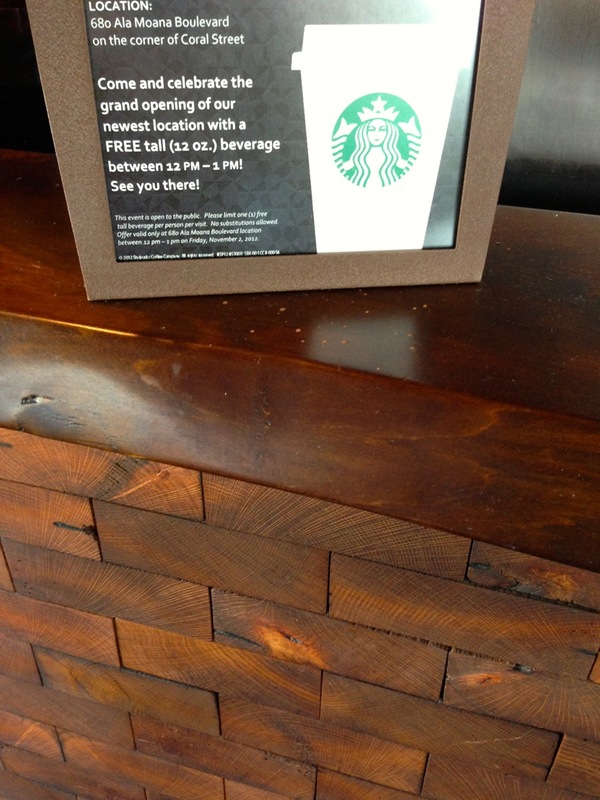 If you visit between 12pm and 1pm, you’ll receive a free tall beverage. While you’re there, you can check out this store’s unique decor. 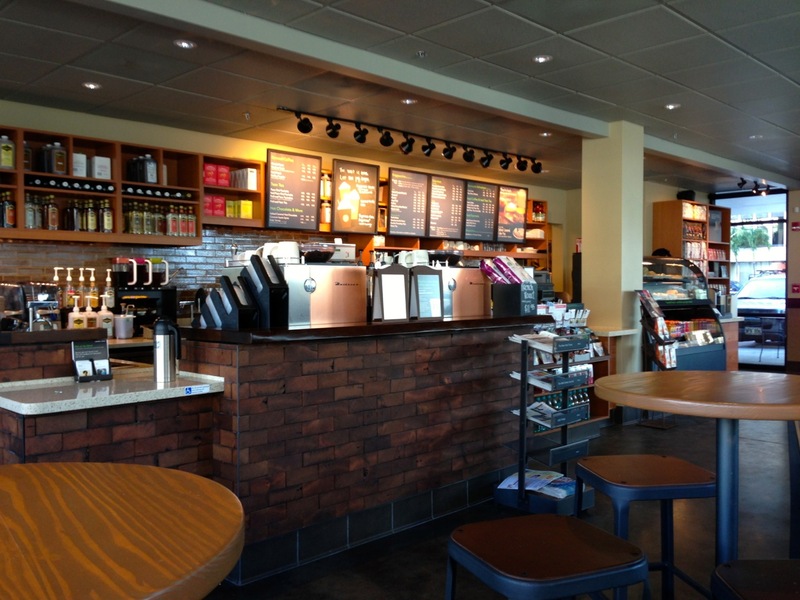 Every Starbucks has common design elements, but you do see differences from store to store. At this Coral Street location, you’ll see a mix of industrial and natural designs. The floor is concrete with divits and discolorations but features many in-ground electrical outlets, especially alongside the window seating. 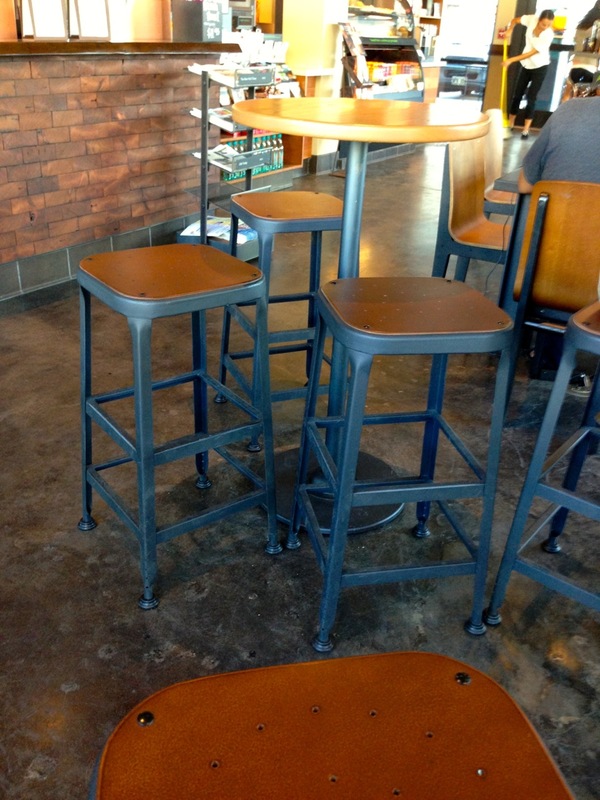 There are a number of window-side stools and higher bar stools and tables for patrons. There’s a single elongated table in the middle and a few comfortable chairs near the front entrance. It seems Starbucks doesn’t want you getting too comfy and camping out for long durations (that’d be you UH medical students 🙂 ). The best accent of this location is the wood bar facade and countertop. There’s a wood “brick” appearance topped off with a dark wooden counter. This adds organic naturalness that contrasts the hard concrete. 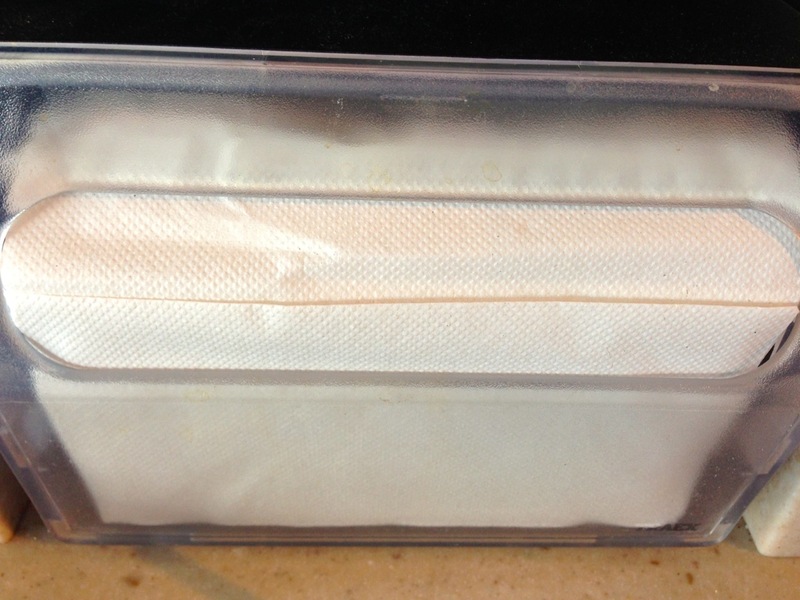 Oh, don’t mind the napkins. I guess they ran out of the Starbucks logo-ed ones and had to settle for generic. Opening day issues I guess. 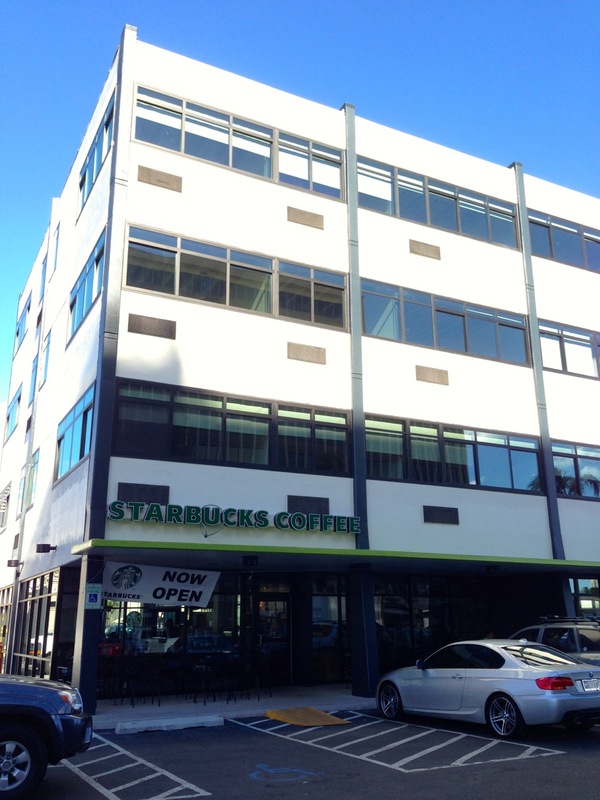 While no Starbucks in Hawaii is a Clover location, I could see this spot featuring the Clover one day. And it just struck me that like the tall exterior of this location, there are lots of tall, skinny elements inside the store. The tables and stools emphasizes a more vertical space if that makes sense. One last note – don’t forget that the Holiday drinks are now available – Peppermint Mocha Frap, Gingerbread Latte, and the Caramel Brulee Latte. Yeah, I’m definitely a little saddened to see this store’s grand opening. It’s definitely a hidden gem since not too many people know it’s there and it’s not really in a high pedestrian traffic area so you can always find a good spot to sit and work no matter when you go there. 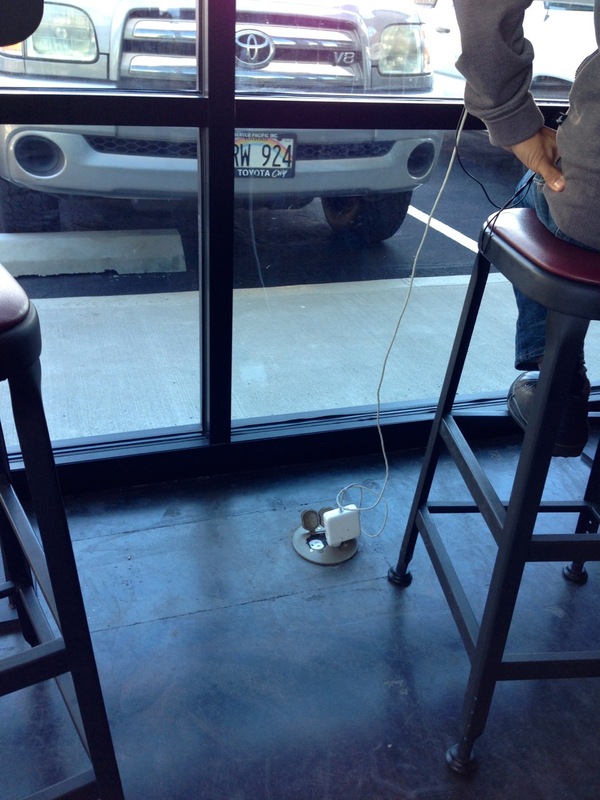 The abundance of floor outlets definitely make it accomodating to work. We’ll see if there’s an uptick in traffic after this grand opening. When I went there, the place was kinda crowded but definitely not packed like the Ward Gateway location. The stools are hard so I can’t see people sitting there for a prolonged time. The parking stalls are narrow too but had lots of open stalls. Thanks for the tip. Would have never known it was there. Thanks to @Yoda808, I found out about this new location. Yeah, it’s definitely not as crowded as Ward Gateway so that’s why I’ll probably patron this location rather than that one. Luckily I haven’t needed to sit on the stools yet, but we’ll see how crowded this place gets after today.